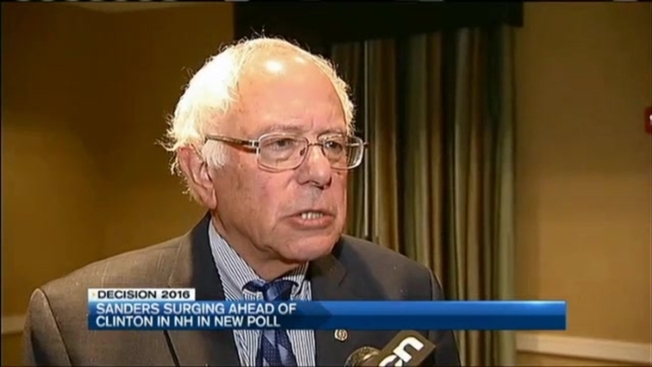 Bernie Sanders was back in New Hampshire Friay - this time with a big lead in the polls. "Polls go up and polls go down - you're right, this one looks good for us," Sanders said in Portsmouth. "But the bottom line is we still have a whole lot of work to do." The latest CNN poll has the Vermont senator at 46 percent of the vote in the Granite State, compared to 30 percent for Hillary Clinton on the Democratic side. Sanders attributes the surge to the political revolution he's been talking about on the campaign trail. "You can't make the changes that have to be made in this country, frankly, unless you are prepared to take on Wall Street, and a lot of corporate America," said Sanders. Friday evening, Sanders spoke to the Portsmouth Democrats Annual Banquet, but prior to the event, he spoke one on one with necn. He said he hopes the pope's message to Washington this week will resonate. "This guy has played an extraordinary role in raising issues that many people prefer not to discuss," said Sanders. "He talks about income and wealth inequality, he talks about the hungry and the sick and the poor." Sanders said he believes there will probably not be a government shutdown. As for thoughts on John Boehner's sudden announcement Friday that he'll retire from Congress soon, Sanders simply said, "not much."